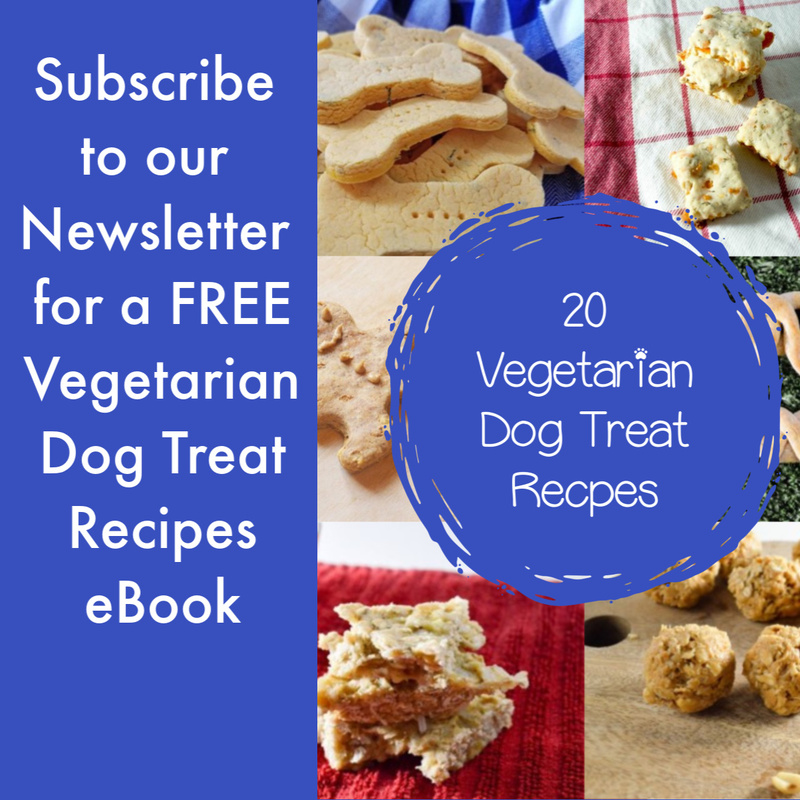 This is a sponsored post written by me on behalf of AvoDerm Natural pet foods. All opinions are 100% mine. For those of us who have dogs suffering from seasonal allergies, using a high-quality, skin-friendly food is more important than ever. Between blistering heat, nasty biting bugs, and pollinating plants, my poor pups always seem to be scratching! While food alone can’t cure seasonal allergies, the right food can support healthy skin and fur. 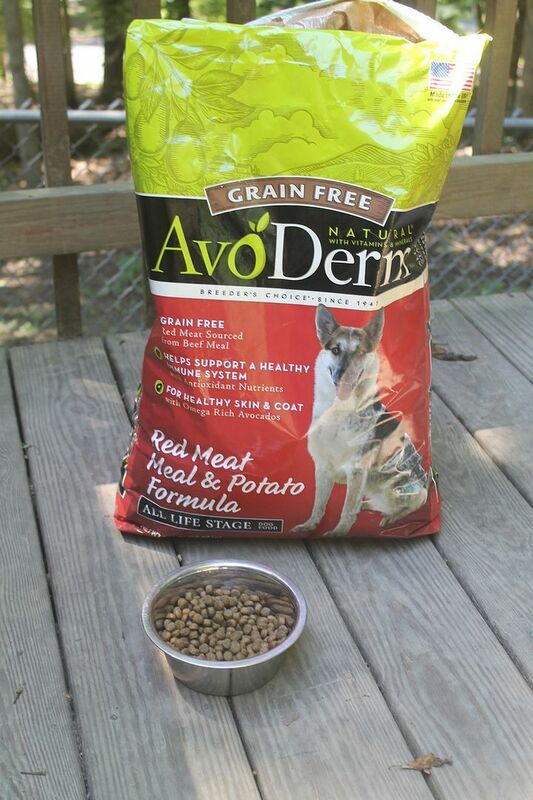 A couple of months ago, I shared my AvoDerm dog food review and told you why this was the food for us. Today, we’re going to talk about how AvoDerm Natural worked for us long-term. We will also debunk some of the myths about avocados for dogs! How does AvoDerm benefit my dogs? For those of you who haven’t had a chance to read our first AvoDerm Natural dog food review, here’s a quick refresher course on my canine testers: Mocha and Freya. Freya is a pure-breed Pharaoh Hound. She was a gift to us after we lost our two of our older dogs back in 2016. 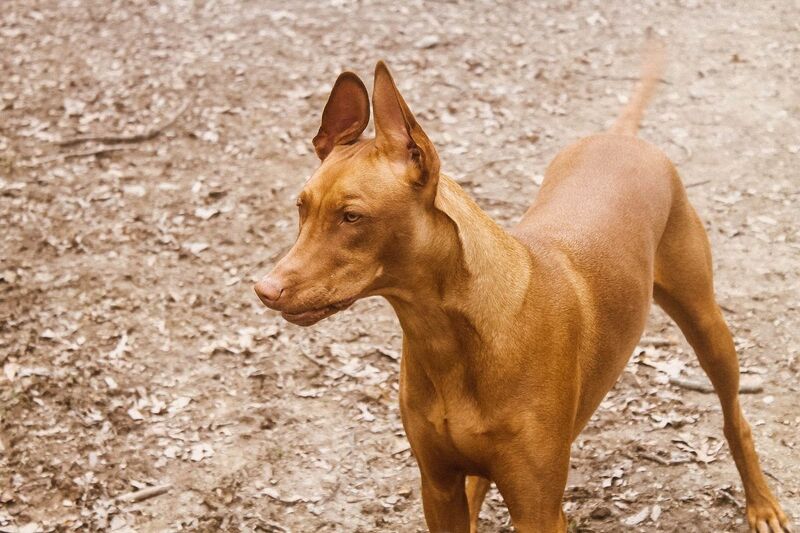 Pharaoh Hounds have super short hair, which is great when it comes to grooming, but leaves their skin rather exposed to the elements. There’s some debate among Pharaoh Hound parents as to whether they naturally have sensitive skin, but in Freya’s case, we err on the side of caution and choose skin-friendly products whenever possible. 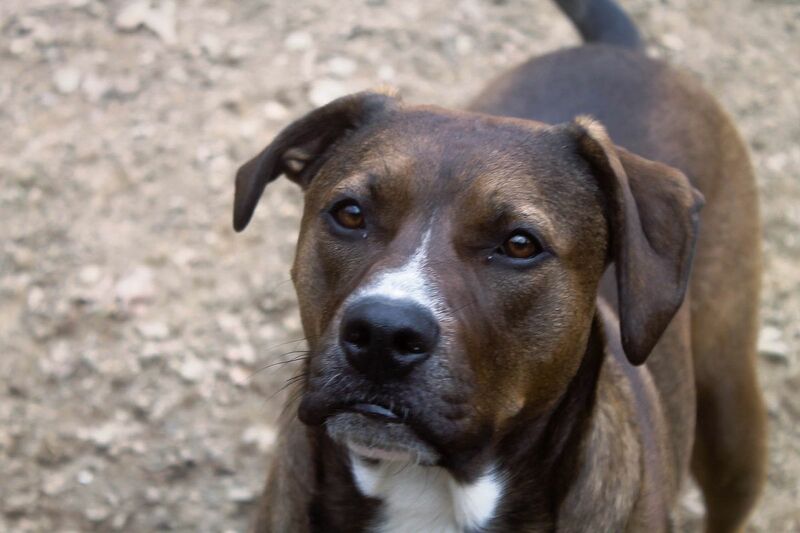 Mocha is a rescue dog that we know is at least part pit bull, and most likely part lab and greyhound. She became part of our family after we lost our old boy, Coop, a little over a year ago. Unlike Freya, we have no doubt that Mocha has sensitive skin. She may be a mystery mix, but when it comes to her skin, she’s all pit! 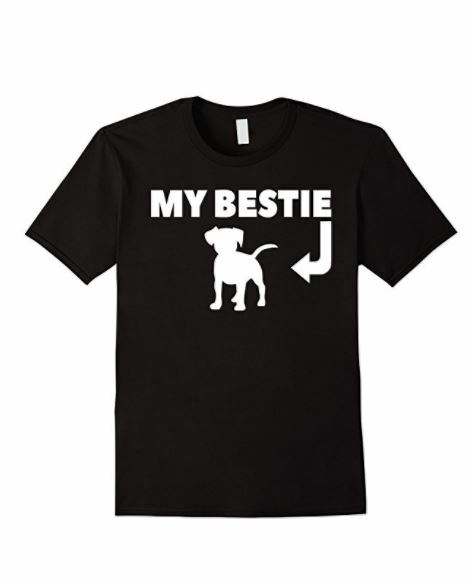 For those of you with pit bulls, you know what this means. Pits just seem to be naturally prone to skin irritation, and Mocha has more than her fair share of issues, especially from late spring to mid-fall. As you can see, both of my dogs can benefit from a skin-friendly food! Now let’s see why AvoDerm is one of our top choices! 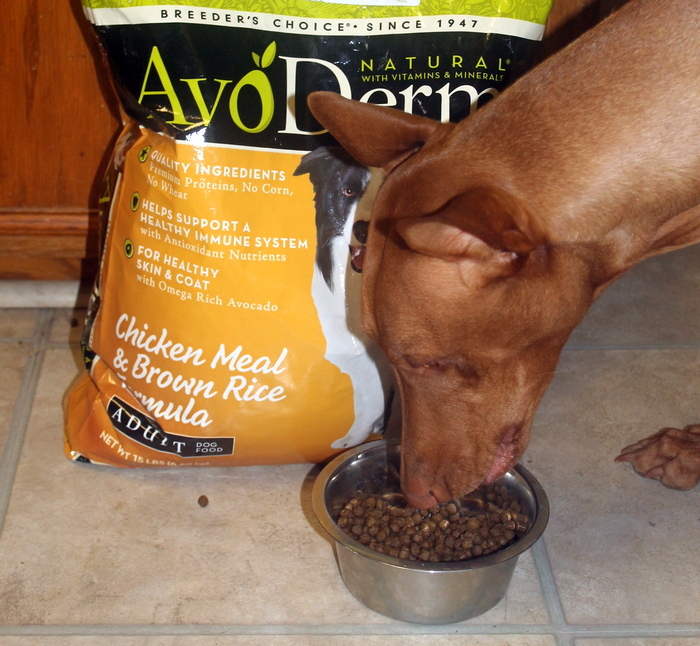 As I mentioned before, I’ve been a fan of AvoDerm Natural dog food for a few years now, ever since I first tried it out with my dog, Cooper. Here are a few reasons why! One thing I love about AvoDerm Natural is how easy it is to rotate between their formulas. This is a huge benefit for those of us with picky dogs who get bored of the same thing for too long, or for dogs who have different seasonal needs. Over the years, we’ve used quite a few of their recipes, including one of their most popular, the Chicken Meal & Brown Rice Formula, that we talked about back in April. We’re currently using their Grain-Free Beef Meal & Potato Formula because our vet is back to recommending that we keep Mocha off poultry while her seasonal allergies are in full swing. 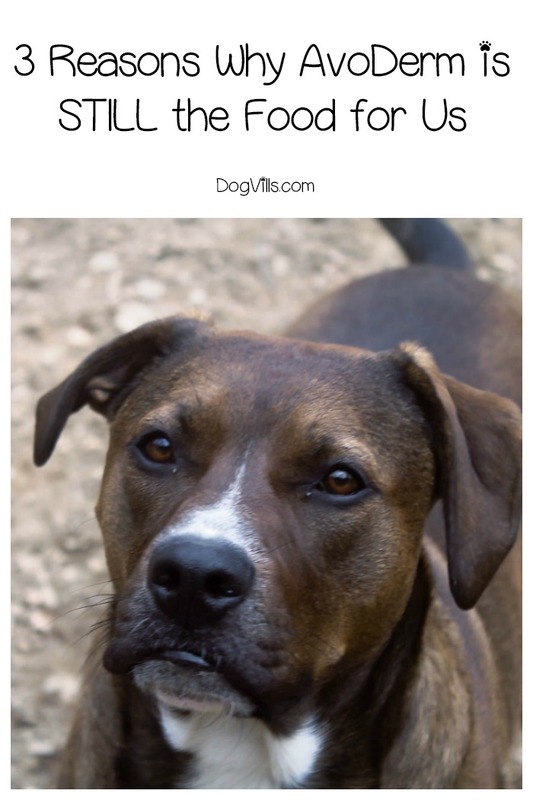 While my dogs have no issues with switching foods or formulas, if your pup has a particularly sensitive stomach, you can still follow the transition guidelines. It’s actually easier since you’ll be transitioning from one AvoDerm Formula to another. California avocados, one of the key ingredients, are packed with good stuff like Omega 3 and 6 fatty acids, which help support a healthy coat and skin. Also rich in fiber and packed with nearly 20 vitamins and minerals, these wonderful little fruits aren’t called a superfood for nothing! Avocados aren’t just wonderful on their own, but they actually help your dog absorb more of the other nutrients they need from their food. AvoDerm carefully selects their suppliers to make sure that only the high-quality avocados make it into their food. 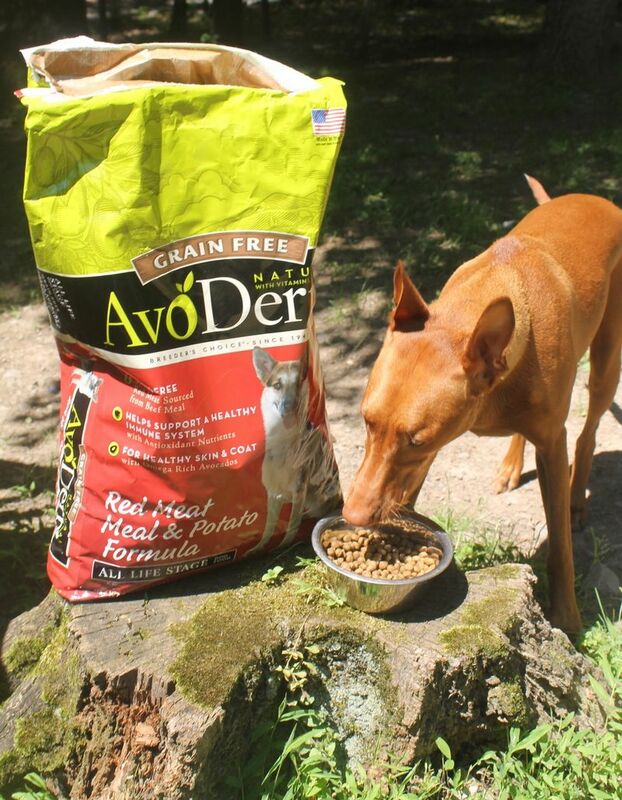 All of the AvoDerm dry food is made in their company plant in California, and every ingredient is tested before being accepted. Once they’ve found the best ingredients, they make all their foods in small batches cooked at lower temperatures to support better health and digestion. Along with the best avocados California has to offer, AvoDerm chooses ingredients that help reduce food allergies and sensitivities. This means no corn or fillers, no wheat, no soy, and no artificial preservatives. Also, while you’ll see the word “meal” next to meat on the label, they do not use animal by-product meals. First, let me just say that AvoDerm doesn’t make any health claims about their food. I am also not making medical or health claims here. Every dog is different, and no one can guarantee how they’ll react on any food. That said, I will tell you that I notice that Mocha isn’t quite as itchy when I’m feeding her AvoDerm. Now, she does take allergy medicine, but it really only helps her for a few hours at a time and she has a lot of breakthrough symptoms. AvoDerm isn’t a cure for itchy skin, but the quality ingredients combined with the avocados do seem to leave her coat looking shinier and less dull. The same goes for Freya, who isn’t typically itchy, but who definitely looks shinier! As I’m sure you know, your dog’s coat is a good reflection of the condition of the skin beneath, as well as their overall health. Of course, both dogs love the taste of all the formulas that we’ve tried! Thank goodness, right? I mean, if your dog isn’t going to eat something, it’s kind of impossible for them to reap the benefits! Now that we know why I love AvoDerm and how my dogs feel about it, let’s discuss the truth about avocados for dogs. I touched on this a smidge in our last post, but it bears deeper discussion. There are many out there who believe, despite evidence to the contrary, that the entire avocado is deadly to dogs. This just isn’t true. AvoDerm explains why and how their avocados are safe for dogs, but if you’re like me, you need to hear it from a totally unbiased source. With that in mind, I did a little digging. Okay, a lot of digging! Avocados contain persin, which many believe is toxic to dogs. It’s not. It IS toxic to certain other animals, like birds, horses, and cattle, but not to cats and dogs. If you’re still not convinced, note this: persin is found in its largest quantities in avocado seeds, skin, leaves, and pit. AvoDerm uses the meat of the fruit, and only after it’s ripe and separated from the skin. In SOME cases, dogs can get an upset stomach from eating an excess amount of avocado, which likely led to the “it’s toxic” myth. AvoDerm balances the avocado with other quality ingredients, so this really shouldn’t be an issue. The biggest danger of feeding your dog avocado comes from the pit, which is a choking hazard. Obviously, you’re not going to find avocado pits floating around in their food! 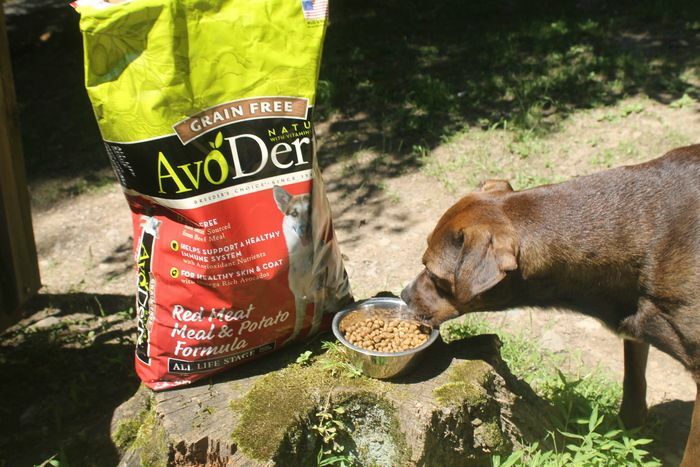 Another thing you need to remember: AvoDerm Natural dog food was created after extensive testing by Breeder’s Choice Pet Foods, people who know how to make a safe and healthy food. If they didn’t know what they were doing, do you really think they’d be in business since 1947? While you can find AvoDerm at most major pet stores online and in some brick-and-mortar locations, I prefer to buy mine from Amazon. As a Prime Member, it arrives within two days, so I can order almost last-minute when I realize I’m getting low. Ready to try AvoDerm? Switch now on Amazon! What are your thoughts on my updated AvoDerm dog food review? Have you tried this high-quality dog food yet? Tell me below!